Welcome to maritimeradio.org, where you’ll find the stories of New Zealand radio communication stations that were originally operated by the Post & Telegraph Department, and later by the New Zealand Post Office and finally by the privatised company Telecom. These stations provided not just communications with ships but also point-to-point services internationally and to isolated parts of the country. Although several such stations once operated from around New Zealand, all point-to-point services have now been replaced by satellites and undersea cables. A single radio station operated by Maritime NZ serves shipping and small craft from the middle of the North Island, although it is controlled from the capital, Wellington. 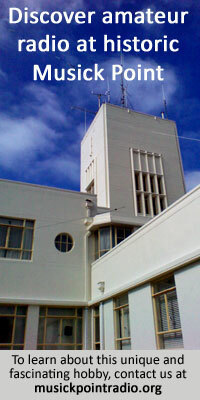 One former station, Auckland Radio ZLD, has been preserved by an enthusiastic group of “ham radio” operators, while the former transmitter building at Awarua Radio ZLB became a museum in early 2016. The other stations live on in memories only, and this website aims to enhance those memories in words, photos and recordings. Some of the material covering Awarua Radio ZLB comes from a website created by the late Alan Gilchrist. When Alan decided that he could no longer maintain his website due to failing health, he kindly allowed me to republish his material here, where I trust it will be available for many years to come. Alan’s information came largely from Alex Glennie, whose father was an operator and manager at ZLB, so thanks also to Alex for his cooperation and generous assistance with this project (and for the photos at the top of this page – that’s his dad, Charles Alan Glennie, pictured at the microphone). Many other people have contributed (and continue to contribute) content for this site, which is greatly appreciated, and they are mentioned in the acknowledgments. This site now includes significant material on the very impressive Himatangi and Makara stations which were operated by the New Zealand Post Office for long-range communication. The small radio installations at lighthouses were also maintained by the NZPO technical staff and there are some interesting notes and photos showing life at these outposts. And of course, coast stations would be very lonely places if there were no ships to talk to, so we have the beginnings of a section on ships’ radio rooms and radio officers. Your feedback – and any contributions of information or photographs – are much appreciated. And of course, please let me know if you spot any errors or omissions. Hi there. Here an excerpt from my book, ‘A Lighthouse Keeper’s Cookbook – Stories and recipes from New Zealand lighthouses.’ Also a Facebook page with same name. One of the keepers I spent time with here was a giant, 6 foot 6 inches, solid, a good sort. We watched The Last Samurai on TV. Every morning we greeted each other with ‘Konichiwa.’ When he left after his stint I waited until he was on the ferry back to Wellington, then sent him a telegram. To passenger Lashlie. ‘Please come back. All is forgiven.’ Principal Keeper, Brothers Island. The three of us on the island cracked up, wondering what would happen. Twenty minutes later the phone went. It was the operator at Wellington Marine Radio (ZLW) in somewhat of a state. He had a return message from Lashlie, with approval as it transpired from the captain. To Principal Keeper, Brothers Island. ‘Captain has agreed to turn ship around. Please have billy-pugh ready and have tea prepared for 350 passengers in an hour.’ Lashlie. The operator at ZLW wanted to know if we needed assistance. I had to tell him it was a joke. The next boat day we received a large bottle of saki with cups and jug from Lashlie. Konichiwa! Apologies to offer a view to the contrary but the New South Wales State Government never administered Coast Radio Stations in New Zealand. See my reply earlier in this thread. The answer lies with the International Radio Telegraph Conference held in London in July 1912 which established international callsigns with prefixes allocated to different countries. I have just come across this website as well. I’m Peter Banks and worked at Wellington Radio for several years in the 1970s until 1977 when I moved to Auckland. We had a team of 4 or 5 at time doing maintenance work 5 days a week with call out duties if required after hours. I mainly maintained the Receiving section and each day had to check the clock against the pips from London at 11am. The weights we used then where washers to keep the clock accurate. When I moved to Auckland I purchased a house in Pakuranga close to Howick where Auckland Radio was based. I also worked there in a few times and also took turns at callout if faults occurred. that night it was very good spread and my old team only had 18 watts approximately. Suddenly I hear a call from a station that is identified as Radio Concurry, I ask him if he listens to me and he answers me in a very clear Spanish language telling me he listens to me loud and clear. My postal address from my country asks me to go to Darcela, after spending almost a year and a half I get the mail with a card and a flag of the Coastal Radio Station. Today I am 58 years old and never again communicated with that radio station. I only remember the card and the pennant which is still hanging in my transmission room. I worked at Cape Naval Radio (ZSJ) Cape Town, South Africa, in the mid sixties as a ship shore operator on 8 Mhz, and one night a British ship sent a SLT to me to be relayed to GKL and afterwards he asked me if I would make a phone call to someone. I said yes and asked where the person lived and he said, Wellington. It was outside of the Cape Town area but only about 100 kms distant so I tried to phone the number but I couldn’t get through and eventually we found out the guy meant Wellington NZ. He was talking to the wrong radio station! What a great interesting site,pure nostalgia which kindles many happy memories.I started my working life as a Post Office Radio tech and spent a good part of that time at ZLW before moving on to work at the then NZBC. In retrospect my time at ZLW was the best job I had,interesting rewarding work with the greatest ever bunch of people.Sad to see that a number of these have passed on. Thanks for setting up this valuable site. Would love to hear from those people that I knew and worked with. I believe you may have worked with my late Dad, Jim Barraud – perhaps at Broadcasting House? My dad (Ray Allsop)was the officer in charge of the transmitting station, ZLW in Wellington from around 1940? until it was closed down for Himatangi. He was then transferred to a job in the post office building in the city, a job and boss he hated. I was born in Jan. 1940, and well remember walking up the hill to meet him almost every day after school. I have many good memories of those years. Where is the evidence? Please help me. In all my research of Coast Radio pouring over hundreds of old files at the Southland Museum and Archives in Invercargill, Archives NZ in Dunedin, Archives NZ in Christchurch, Archives NZ in Wellington and Archives NZ in Auckland I have never seen any evidence of this. In this regard I have also visited the Chatham Islands. This also includes visiting and talking with many dozens of retired radio people up and down the country. I have found no evidence and neither has it been mentioned by anyone of The New South Wales Govt administered The Dominion of New Zealand Coast Stations. One must also consider that New Zealand was a “sovereign country” with it’s own system of Government and hardly likely to let another Government or country administer it’s affairs in this manner. Sorry I do not agree. New South Wales did not govern New Zealand in radio regulatory matters. At this conference British colonies were allocated callsigns beginning with ‘V’, possibly because that letter could be associated with Queen Victoria. Australia was allocated the block VHA – VKZ and so changed its PO designation to VI for all its coast stations so that POP became VIP and POS became VIS. New Zealand was allocated the code block VLA – VMZ and its coast stations changed to the use of VL prefixes hence VLA – Awanui and VLB – Awarua. You will see no mention of NSW governing New Zealand radio matters. Further to my last reply New Zealand and Australia do not appear to be signatories to any Radio Conference or other agreement prior to 1912. Another point, NZ’s accountability to NSW ended on 1 July 1841. NZ became a dominion in its own right in 1907. So it is highly improbable there was any formal link with the NSW Government after 1841, and certainly not after 1907. As an ex operator at ZLW and ZLC i have really enjoyed finding this site and taking a trip down memory lane. Congrats and thanks to all have made this happen. I particularly enjoyed Clyde Williams articles. I only wish as a young man i had realised what this job would mean to me and taken a few more photos. I was stationed at ZLC Chatham Islands Radio at the time. ZLB Awarua Radio picked up the Gothic’s (callsign MAUQ ?) on the 8 mHz lifeboat emergency radio frequency; the ZLB operator was the late Dave Dow. For a while, not knowing that the bridge and radioroom, plus some passenger accommodation, was destroyed by fire, it was thought the Gothic might have headed for Chathams as the nearest point of land. She actually sailed to the mainland, either Lyttelton, or Wellington. Sadly, there were two fatalities, a woman and young son. Came across this book last week. “Invaluable Service” by Desmond Ball, Cliff Lord and Meredith Thatcher. The front cover has a picture of Musick Pt station which is what caught my eye. It details the work of the Coast Radio Stations during WWII in signals interception – also ZLB in intercepting comms from the German Fleet in the Pacific in WWI. A bit technical so it can be a hard read, but worth persevering. Tried to include a photo of the front cover but its beyond my technical competence. Amalgamated Wireless of Australia (AWA) were associated with the contract to build the New Zealand Stations. Australia also administered them, hence the original VLx callsigns, at least up until the 1920s, when New Zealand took up full administration and the local station changed to the ZLx callsigns. This might explain why early information is difficult to find?